An upper ridge remains centered over the UK while a powerful trough rotates over NE Europe. Another short-wave is pushed into S Scandinavia in the evening hours. A gradually deepening upper low W of Iberia affects Portugal along the stationary front while a weak upper low over N-CNTRL Mediterranean gradually weakens while moving east onto the Balkans. A MDT risk has been issued for southern Balkans with threat for large to very large hail, damaging winds, torrential rain and some tornado threat. Widespread storm activity is expected. Locally, persisting storms and orographic rain could enhance flash floods threat significantly. A SLGT risk has been issued for surrounding areas of MDT risk and into NNW Turkey where more isolated storms are expected, posing threat for large hail, severe winds and heavy rain. A SLGT has been issued for S-CNTRL Adriatic into central Italy with threat for waterspouts and excessive rainfall over Italy due to slow moving storms in moderately unstable environment. ENE flow from the Adriatic inland into central Italian mountains could also enhance rainfall amounts. 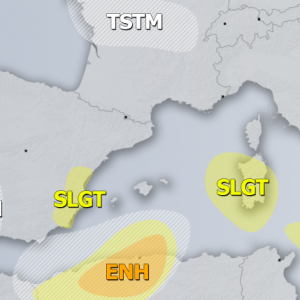 A SLGT risk has been issued for NE Algeria into N Tunisia with threat for isolated storms posing threat for large hail, severe winds and heavy rain. 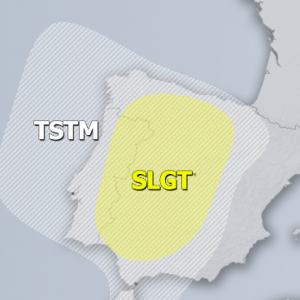 A SLGT risdk has been issued for E Iberia where some organized storms are possible with large hail and excessive rain as primary threats. 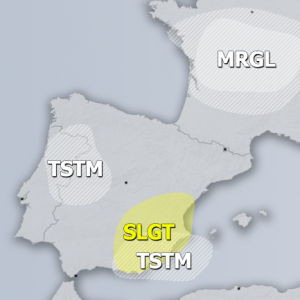 A TSTM+ area over S France and W Alps was placed where some organized storms are possible but limited coverage and shear (further north over France) is expected. Marginal hail and excessive rain are primary threats. A TSTM+ area was also placed from NE Black Sea into W Russia along the southwards moving frontal system. Heavy rain, marginally large hail and strong to severe winds are possible.